Another day has brought another attempt by Young Dave and his jolly good chaps to pick a fight and show that they are the masters now. But, sad to say for those of a right-leaning disposition, the move to sneak through what would effectively be a repeal of the Labour act that banned fox hunting with packs of animals under cover of a Statutory Instrument failed when the Government realised it was about to lose and pulled the vote. You Jock cheppies over thyah! Keep ite of our jolly English hunting vote, won't you? Jolly good sheow!! Restoring the freedom for groups of riders on horseback, accompanied by a pack of hounds, to chase a fox and see it literally torn to pieces, all in the name of sport, was an idea to which Cameron, given the constituency he represents, his social circle, and his political inclinations, was highly susceptible. The problem for him was that his majority is only 12, and the SNP had decided to being their own dog to this particular fight. Worse, the idea that it needs all those horses and riders, along with their dogs, to perform what is claimed to be pest control is clearly bunk. You have a fox that is a pest? Look no further than the nearest gamekeeper and his trusty shooter. As Harry Callahan might have put it, “Bang … dead”. Worse still is that some on the right are learning all the wrong lessons on the hunting vote. I will explain. There have been protests over the decision of the SNP to intervene in the debate, because, well, this is an English matter, dammit. But the Scots beg to differ: they have their own thoughts on how to tighten the law on hunting, and if the Tories really mean they want to align the law in England with that in Scotland - one of the most-touted excuses for the law change - the Scots changing their own law would have a knock-on effect. Of course, there was no intention of just aligning English law with that in Scotland, and now that deploying that excuse has dragged the SNP into the fight, the Tories are making it clear that they will just have to press on with “English Votes For English Laws” (EVEL) and bring the measure back to the Commons later. However, and here we encounter a significantly sized however, it might not be that simple. As Faisal Islam has observed, those Tories opposed to the change claimed to have the support of three ministers plus around 50 back-benchers. Others have indicated they would abstain. Even with EVEL, Dave and his pals would be far from certain of carrying the vote. Worse again, the constant attempts to gerrymander the Commons risk further undermining the Union they claimed to want to preserve only last year. The problem here is not the dastardly Scots, it is the Tories’ own lack of direction. Their chosen battlegrounds - the Human Rights Act, Hunting, EVEL - matter little to most voters. Their next fight, over the EU, comes when two-thirds of voters are in favour of the UK’s membership continuing - despite all the hostile coverage. 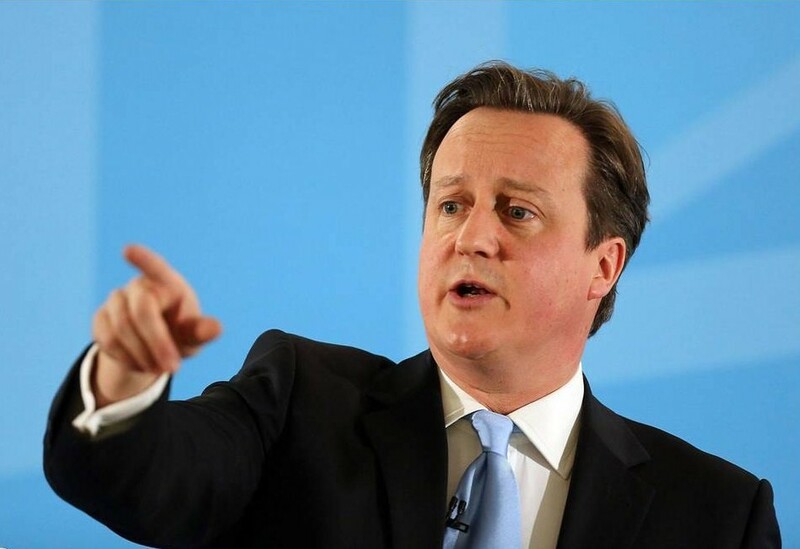 All that Cameron’s “renegotiation” will do is to damage his own party. 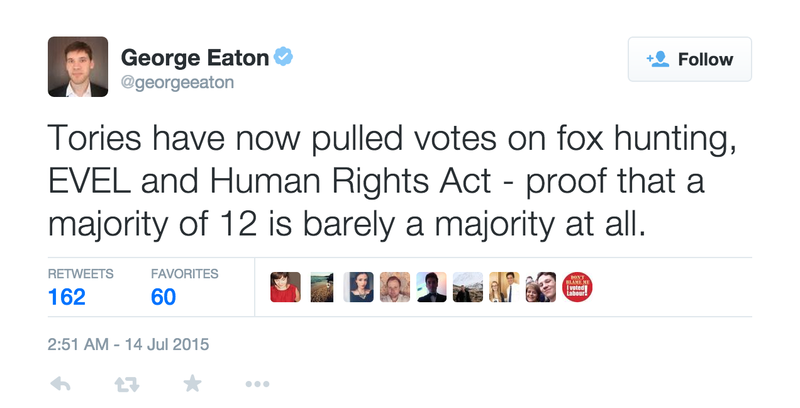 The SNP may have shot his fox this time. His own party will do the job next time round. Has Parliament really nothing more to do than play a 'who blinks first' game with each other to score a few points? I suppose with only 2 days to go all the MPs are like giddy school kids and looking forward to their extended summer break. Once EVEL is in place every law will need even more scrutiny to show it has no impact on Scotland, with subsequent legal challenges if any area has not been considered - the lawyers will be salivating at the prospect. Interestingly enough the Tory MP for Dartford who had always said he would vote to repeal backed down this morning and switched. This a guy who has always voted with the Government but took so much heat from constituents (and even the local Tory run council who realised it was very unpopular and reflecting back on them) He sensibly realised nothing in it for him. Suspect a few behind the scenes in suburban seats wavered. Any news from Edward Timpson, MP for Nantwich and part time photo-op for Crewe, who took £10,000 from a pro hunt lobbyist in early 2009, told the local paper he had no views on hunting in late 2009 and then annnounced he was firmly in favour of it 4 weeks after the 2010 election.